Homo sapiens first left Africa about 60,000 years ago. Most of the original tribes that left Africa either perished in the harsh environments of Asia or were replaced by later arriving tribes that had developed superior technology or subsistence strategies. The people who eventually conquered Asia look and behave quite differently from the initial African colonizers. However, there is a relic population of early Homo sapiens on the Andaman Islands located in the Bay of Bengal near Malaysia. Scientists believe a land bridge connected the Andaman Islands with Malaysia during Ice Ages and early Homo sapiens walked there. Rising sea levels isolated the Andamanese and protected them from being killed or assimilated by groups that later conquered Asia. Genetic evidence suggests the Andaman Islanders diverged from the rest of humanity 60,000 years ago. Location of the Andaman Islands. They were connected to Malaysia during Ice Ages due to lower sea levels. The Andaman Islanders are related to African pygmies but are considered negrittos–people smaller than average in size but larger than pygmies. This smaller stature probably helps them survive on islands where they have less food. It’s an evolutionary advantage to have lower caloric intake needs on islands, and dwarfism is common among large species of mammals that became trapped on islands. People on 1 particular Andaman Island known as North Sentinel have been isolated longer than any other Andaman Islanders. Their language is far different from the 2 languages spoken on the other Andaman Islands, and they have incredibly primitive technology. All attempts to communicate with them have failed because no one in the outside world understands their language. The North Sentinelese kill outsiders on sight, explaining why they have been isolated for so long. They have no agriculture, and some believe they depend on lightning strikes for fire, though I doubt this. I think our evolutionary ancestors (H. heidelbergensis and H. erectus) had fire, but who knows–maybe the North Sentinelese forgot fire-making knowledge. The unfriendly North Sentinelese attack outsiders on sight. Here, they are about to shoot arrows at a passing helicopter. Note the red-ochre painted faces. There are only 40-400 North Sentinelese living on the 24 square mile island. The island vegetation prevents an aerial survey of the population. They eat wild pigs, fish and shellfish, and wild plant foods. The Indian government (owners of the Andaman Islands) abandoned attempts to contact the tribe and outlawed other outsiders from visiting the island. It’s unsafe for outsiders because they will be attacked, and introduction of infectious diseases would probably wipe out North Sentinelese because their immune systems have been isolated from other humans for so long. The North Sentinelese recently murdered 2 drunken fishermen who drifted too close to shore. Also not long ago, a typhoon wrecked an oil tanker on a coral reef off the island, and the crew had to fight for their lives before being rescued. The North Sentinelese stripped the ship bare. They shoot arrows at all passing helicopters. The North Sentinelese represent what Pleistocene man was like 60,000 years ago. Pleistocene people were small of stature and dark-skinned. Genetic evidence of a 10,000 year old skeleton in Britain suggests even some Europeans were dark-skinned during the Pleistocene. They had primitive technology and were hostile to strangers. The descendants of these small violent humans conquered the world. Most species of freshwater turtles can travel overland and occupy new favorable habitat, promoting genetic vigor within the meta population. They often move between watersheds, and this explains why so many species have such a continuous geographic range. I’ve seen snapping turtles (Chelydra serpentina) and yellow-bellied sliders (Chrysemys scripta) a considerable distance from any water source. However, map turtles in the Graptemys genus (10 species) do not travel overland, and their ranges are usually restricted to single river drainages. So how did closely related Graptemys species colonize different river drainages even though they don’t travel overland? The dispersal of the Graptemys genus is closely related to Pleistocene sea level fluctuations. Barbour’s map turtle is the closest living relative of the extinct Kerner’s map turtle. Barbour’s map turtle range. Note how it is restricted to 1 river system. Map of Florida during the Last Glacial Maximum. Different rivers in Florida isolated by sea level rise today were interconnected on land exposed on the continental shelf due to sea level fall. This allowed map turtles to colonize adjacent rivers systems where they evolved into distinct species following sea level rise and isolation of populations. During Ice Ages sea level fell because so much of earth’s atmospheric water became locked in glacial ice. In Florida dry land habitat extended 120 miles west into the Gulf of Mexico. Several of Florida’s river systems that are isolated from each other today by sea level rise were interconnected during the Last Glacial Maximum on the land that was exposed by ocean recession. This allowed an ancestral population of Barbour’s map turtle (Graptemys barbouri), a species today restricted to the Apalachicola-Flint-Chattahoochee River System, to colonize several other rivers in Florida. Subsequent sea level rise isolated this founder population in the Suwanee, Santa Fe, and Waccasassa Rivers where they evolved into a now extinct species known as Kerner’s map turtle. Specimens of this species have been found in all 3 of the above mentioned rivers in Florida, and the type specimen (a complete skull) came from the Suwannee. Kerner’s map turtle had a wider shorter skull than any extant species of map turtle. Morphologically, it most closely resembles Barbour’s map turtle, the extant species that has the widest shortest skull among living Graptemys turtles. There is an east-west gradient in the shape of map turtle skulls. Western species have narrower longer skulls, but map turtle species’ skulls get shorter and wider the farther east they occur. Kerner’s map turtle was the easternmost species, and it ranged into north central Florida and possibly southeastern Georgia where the Suwannee River headwaters originate. Rare earth element analysis indicates Kerner’s map turtle lived during the Rancholabrean Age (300,000 years BP-11,000 years BP). There are no known Graptemys specimens older than the mid-Pleistocene. The extinction of Kerner’s map turtle likely occurred during a dry climate stage of the mid-Holocene (~6,000 years BP). Map turtles require fast moving high water where they can disburse up and down rivers. But drought turns their habitat into stagnant isolated pools that can also be detrimental to their favorite food source–freshwater mussels. 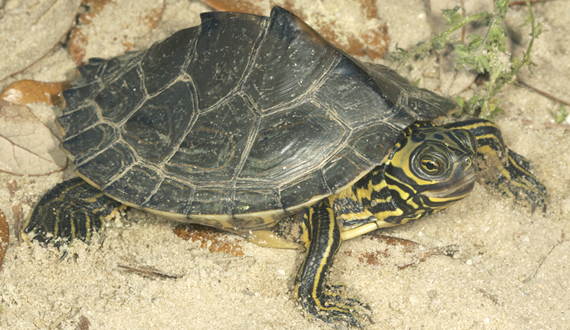 Other species of freshwater turtles and alligators can survive these conditions by moving overland until they find good habitat, but map turtles don’t travel overland. That’s why most species are restricted to major rivers that rarely, if ever, suffer sporadic flows. The founding species in the Graptemys genus undoubtedly evolved in the Mississippi River. Almost all other species exist in other river systems that empty into the Gulf of Mexico. Pleistocene sea level fluctuations facilitated the colonization and speciation of map turtles in the Apalachicola River drainage, the Guadulupe River System, the Pascagoula River, Mobile Bay drainage, Yellow River System, and Pearl River. Different map turtle species live in each. Ocean recession allowed the rivers to become interconnected on the continental shelf, and map turtles were able to colonize adjacent river systems; then sea level rise isolated populations, causing speciation. During temperate climate cycles of the Pleistocene leopards enjoyed an even wider geographic range than they do today, living in Europe as well as Africa and Asia. Leopards colonized the island of Sumatra during the middle Pleistocene but became extinct there at the end of the Pleistocene, despite continuing to thrive elsewhere in Asia. Scientists used a statistical model to determine why leopards disappeared from Sumatra. They considered all potential competing carnivores and total prey biomass in their calculations. Leopards shared Sumatra with orangutans, monkeys, humans, elephants, deer, tapir, pigs, sun bears, tigers, clouded leopard, Asian golden cats, and dholes. Tigers are known to depress leopard populations in regions where the 2 species overlap; and dholes, a pack-hunting dog, compete for the same large prey species. Scientists expected the model to show competition with tigers and dholes caused the extinction of leopards on Sumatra. However, when they removed the influence of these 2 species from their model, leopards still became extinct. Leopards also became extinct when humans were removed from the simulation. Surprisingly, the statistical simulation suggests competition with clouded leopards (Neofelis diardi) and Asian golden cats (Pardofelis temminckii) caused the extinction of leopards on Sumatra. Asian golden cats. This species along with clouded leopards outcompeted leopards on Sumatra following the end of the Pleistocene. 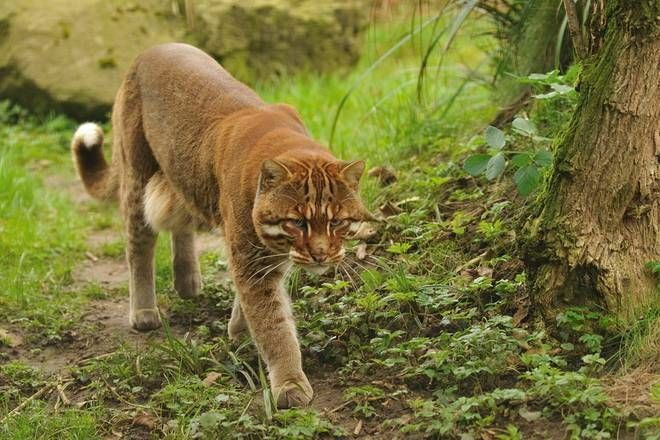 The authors of this study propose ecological changes following the end of the Pleistocene greatly favored smaller forest cats over leopards. During Ice Ages Sumatra was a mix of savannah, woodland, and forest; but wetter climate fostered the spread of thick forest. Larger prey species became less common, so leopards were forced to compete with the smaller cats for smaller prey items. Both of the smaller species of cats reproduce faster than leopards and produce larger litter sizes. The extremely adaptable leopard was actually squeezed out of its ecological niche on Sumatra by 2 smaller felines. Adult leopards weight between 80-200 pounds compared to a maximum of 57 pounds for clouded leopards and 35 pounds for Asian golden cats. The latter 2 species are efficient predators of small animals and need less food than leopards, giving them an advantage when available protein biomass declines. Clouded leopards are 1 of the most primitive species of living cats and may be related to the evolutionary link between big and small cats. The Sunda clouded leopard is the species that lives on Sumatra. It diverged from the other species of clouded leopard ((Neofelis nebulosa) about 70,000 years ago. Clouded leopards from Borneo crossed a now submerged land bridge and colonized Sumatra following the Tuba volcanic eruption that wiped out much of Sumatra’s wildlife ~70,000 years BP. The Sunda clouded leopard was not recognized as a separate species until 2006. Many extinct species of Pleistocene megafauna had a wide ranging geographic distribution. Jefferson’s ground sloth, long-nosed peccary, Columbian mammoth, and mastodon occurred from coast to coast and from Florida to the glacial boundary. These species and their similar evolutionary ancestors existed across the continent for millions of years, surviving dozens of major and minor climatic fluctuations. They lived in a variety of environments and were capable of subsisting on many different foods. Multiple lines of evidence show these pre-historic beasts ate a varied diet. Mastodon coprolites (subfossil feces) contain bald cypress, buttonbush, spruce twigs, fruit, acorns, aquatic plants, and numerous other items. Now, a new study of mastodon teeth using dental microwear texture analysis confirms that mastodons ate a wide variety of foods. Mastodon tooth. Scientists looked at mastodon teeth using microscope technology and determined mastodons from different regions ate different foods. Scientists microscopically examined 65 mastodon teeth that were found in 4 different geographic locations including Florida, Missouri, Indiana, and New York. The microwear found on mastodon teeth from Florida differed from wear on teeth from northern mastodons. Florida mastodons primarily ate bald cypress twigs, while northern mastodons ate spruce, hemlock, pine, larch, and juniper. The differences in tooth wear indicate mastodons could eat a variety of plant foods and were not dependent upon a single species. The authors of this study also looked at mastodon teeth from different climatic stages in Missouri. Mastodon teeth from a climate stage when open jack pine and prairie predominated showed little difference from teeth dated to a climate stage when spruce dominated the landscape. The microwear on mastodon teeth resembles the microwear found on 2 living species–moose and black rhino. Like mastodon, these 2 species subsist on woody browse. I think this study is just more evidence against the climate change model of extinction that proposes changes in climate caused corresponding changes in plant composition, leading to megafaunal extinctions through nutritional deficit starvation. None of the plants mastodons ate ever disappeared or even became rare in the environment. The authors of this study take a more neutral stance toward the debate. They acknowledge the “plasticity” of mastodon diet but seem reluctant to admit their study is strong evidence against the climate change model of extinction. Instead, they suggest future studies using dental microwear texture analysis could uncover the reason why megafauna became extinct. In my opinion it already has. Their data rules out the climate change model of extinction by revealing the dietary adaptability of mastodons. Through the process of elimination, human overkill is the only plausible cause left standing. You are currently browsing the GeorgiaBeforePeople blog archives for March, 2018.